It’s at this time of year that thousands of people start dusting off their snow boots and head for the slopes of the Northern Hemisphere. Packing the right kit is essential, but there is only so much an expensive pair of ski boots and skis can do. By following the right exercise routine prior to your trip you will not only improve your performance and reduce delayed onset muscle soreness (DOMS) – the stiff aching muscles that follow 24 to 48 hours after first hitting the slopes – but you will also help protect joints and connective tissue from injury and have a much more enjoyable holiday around. To avoid spending most of your holiday with tired legs and a numb gluteus maximus from falling down so many times, your pre-ski exercise routine should consist of strength training, core development, agility and flexibility. Your strength training programme should include large muscle group exercises such as squats, lunges, dead lifts and some body weight resistance exercises such as tricep dips and press ups. Core training is a really important component for ski fitness. Effective core development will ensure you are strong and stable in the trunk and therefore enable you to support quick, powerful dynamic movements. Skiing is very demanding to the central nervous system due to the change of surface and contact points. I use several methods with my clients to develop core stability. The first and most simple is single leg training. When you ski you need to produce force from each leg individually using your core muscles to help you balance. Examples of exercises to help this are single leg tips, single leg touchdowns and upper body resistance work standing on one leg. Not only will these exercises strengthen your core they will also work each leg individually helping to build up the strength your lower body. The rapid transference of weight from one leg to the other when skiing means that the body is rarely balanced evenly. Performing exercises on unstable surfaces will really challenge the core muscles and prepare the body. Stability balls and the bosu are great pieces of equipment for core training. Dynamic jumps and lateral jumps on the bosu will require you to switch on your core muscles to balance. Due to the Aerobic and intermittent nature of the sport, it is advisable to do some cardio vascular training before your trip. This is best conducted in the form of explosive and agility work, which requires short bursts of high intensity exercise followed by low intensity or rest periods. These can be performed using CV machines in the gym, such as treadmills, bikes or cross trainers. Eight sets of high intensity sprints for 20 seconds, followed by 10 seconds recovery on any of these machines will help build up real stamina. Running drills using agility ladders and cones are also great for this and tend to help build core strength as well. For all snow sports training dynamic stretches should be performed following a warm up. These will help increase the body’s flexibility. Some of my favourite dynamic stretches include leg kicks, star jumps, single hip rotations, lying hamstring stretches using a strap or towel and T-bends. 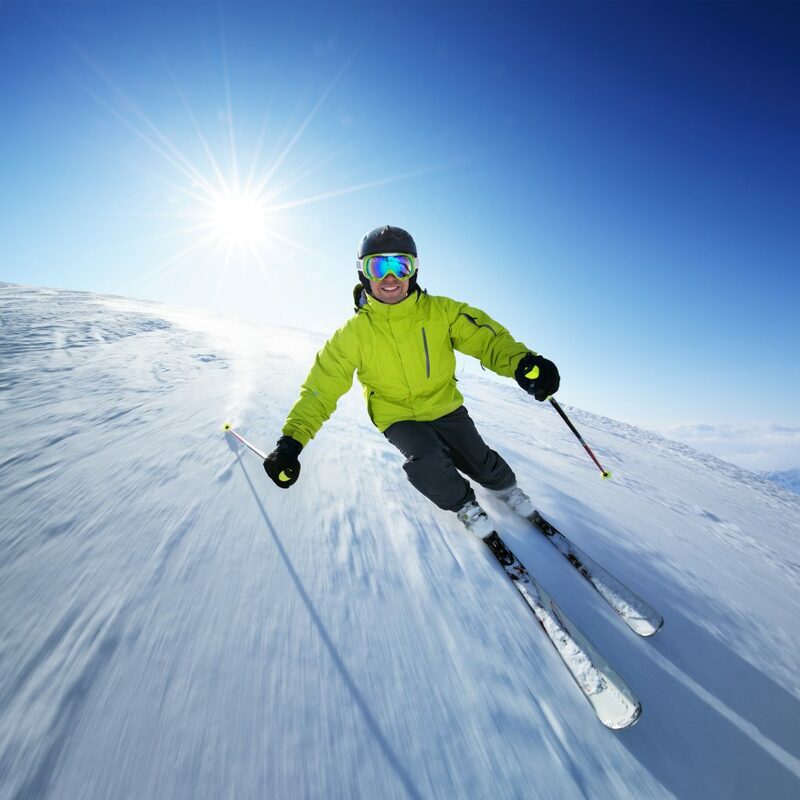 With a little work before your holiday you can not only make sure you are skiing at your best this season, but also best prepare your body in order to avoid any niggling injuries. Once on the slopes, don’t forget to do a couple of easy runs to warm the muscles and joints before hitting the more difficult slopes and showing off all your hard work. Follow a day’s skiing with some gentle stretches and a steaming hot bath and a well earned drink of your choice!